Once you get used to Mafi’s writing style, the story itself is decent. I wouldn’t classify it as a dystopia though; sure, something went wrong and there’s limited food and problems with the seasons that the Reestablishment is trying to fix, but that seems to take the backseat to the romantic aspects of the plot. And, oh, was there romance. Within the first seventy pages, Juliette is in love with Adam – but don’t worry, it’s not instalove because they’ve had feelings for each other since childhood, even though they had never spoken two words to each other until now. Isn’t that convenient? Needless to say, I never really bought the history between them, and found myself rolling my eyes every time they confessed their love for one another or started making out at the most inopportune times. 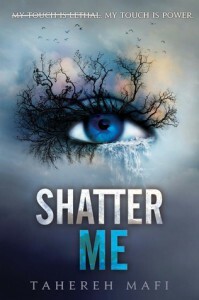 The ending of Shatter Me was by far my favourite part of the story (and no, it’s not only because it was finally over). The action started to pick up, and we were treated to an institution that was very similar to Charles Xavier’s School For Gifted Youngsters. Juliette is basically Rogue. Castle could move objects with his mind and was in charge of training everyone, like Professor Xavier. While it kind of came out of nowhere, it was a nice change from the incessant romance that passed as a plot.